With help from Dean Baquet and Clay Shirky, I set an all-time traffic record on my blog this month. Posts relating to Twitter use by Baquet and his Times colleagues contributed more than 10,000 of the more than 40,000 views on the blog this month. My curation of Clay Shirky’s “tweet rant” about people who see new digital platforms as “the next Facebook” contributed another 3,000-plus. Together the topics contributed nearly one-third of my traffic for the month. Leading the way was Baquet’s guest post questioning whether I and others were creating a “new priesthood” with “new rules for entry,” regarding who is a journalist. It was an overstatement at best and an inaccurate metaphor. But it drew a lot of interest: more than 6,700 views in the month, including nearly 4,900 the first day, when I set a single-day record for views on the blog. Baquet’s guest post and my curations of tweets by Shirky and Lexi Mainland of the Times totaled more than 10,000 views. Perhaps I need to just post other people’s writing to the blog. The October traffic exceeded the record I set in February, when I had 36,179 posts. And I passed the record by Oct. 28, so the longer month didn’t play a role in setting the record, just in pushing the total past 40,000, which I topped last night. I should end today a little over 41K. Though the Baquet guest post was the giant of the month (if anything on a blog this small is a giant), I had two other days over 2,000 views and 16 more days of 1,000 or more. This was the fourth straight month with more than 3,000 views for my 2013 post about Twitter’s refusal to allow reasonable ways around its stupid limit of 2,000 accounts most people can follow. It can’t be good for a company when thousands of people are looking for solutions to your bad decisions. But Twitter doesn’t care. Archives still drive lots of traffic for the blog. A post on attribution, one on accuracy and two posts on the 5 W’s combined for more than 4,000 posts. Another 25 posts from previous months topped 100 views. Social media is important in attracting attention to fresh content on my blog. But archives and search keep people coming back when the content is not fresh but is timely to someone. My Oct. 6 post saluting Matt DeRienzo’s leadership for Digital First Media topped 500 views. Other posts that got a few hundred views told about next semester’s class on interactive storytelling tools, different ways of viewing the size of Twitter’s user base and Planet Princeton’s effective engagement. With 18 posts in the month (this makes 19 and it’s the first one this week), this wasn’t nearly my busiest month (on this blog, at least). I had 30 posts in January and 37 in October 2012 and set personal traffic records in both of those months. Both months got boosts from guest posts and October 2012 also got help from reposting some old posts from my old Training Tracks blog. I also set a record for unique visitors, more than 28,000, breaking the record of 23,508 that I set in September. I also set personal records for traffic and unique visitors on my much smaller blog, Hated Yankees. Though the Yankees, the usual topic of that blog, haven’t done anything in October, my second-favorite team, the Kansas City Royals, had a pretty good month, and I turned my attention to the Royals last month. The month started with a guest post from my youngest son, Tom, a diehard Royals fan from when we lived there in his childhood. He shared his thoughts and emotions about the Royals’ incredible come-from-behind playoff victory over the Oakland A’s. That was the third most-read post of the month, with 122 views. Hated Yankees had never topped 1,000 views in a month before, and it topped 2,600 views in October. My post on keeping my 29-year-old promise to take my oldest son, Mike, to a game in the Royals’ next World Series got more than 700 views and gave me the single-day traffic record on that blog, 510 views. And my post about going to this year’s Game Two got more than 100 views. Part of this month’s big Hated Yankees’ traffic, though, was a 2010 post debunking the myth that strategy is more difficult in the National League. Somehow that has become the No. 1 Google result for “strategy National League.” Maybe the World Series prompts some searches relating to strategy and the designated-hitter rule. Anyway, a post that never topped 100 views in a month got over 600 views in October. Maybe someone linked to the post (though I didn’t get a pingback). At any rate, that post became the most-read Hated Yankees post, passing a 2009 post about Graig Nettles. I also had a post on the International News Media Association’s Culture Change blog this month as well as a couple on the Social Media News Challenge blog. I don’t know what November will bring, but I presume this will be one of the least-read posts of the month. My post about September’s traffic topped out at 79. But I try to practice transparency and I think you should study what’s working and what’s not, so I post this bit of navel-gazing now and then. I’ll probably update the numbers on the weekend, after the month is over. I set a record for unique visitors on this blog in September, even though I was well short of my record for page views. Neither of those facts is a big deal, especially given the trifling totals for the blog on both counts, but I like to analyze my blog metrics to see what I can learn, (and the analysis will no doubt be October’s least-read post). The blog had 23,508 unique visitors in September, just a bit ahead of the previous high of 22,584 in January of this year. September’s total views, 33,222, were a little less than the record of 36,179, set in February, and also lower than January’s total, 35,739. I had more views in January than I’ve ever had in a month on my blog. Sometime Wednesday night or early Thursday, I passed my record of 32,725 set in October 2012. Traffic this morning was at 34,815. I’ll certainly top 35,000 for the month, with a reasonable shot at 36K. Update: With 1,116 views on Jan. 31 (my 16th day over 1,000 views in January), I ended January with 35,739 views, beating my old record by more than 3,000. 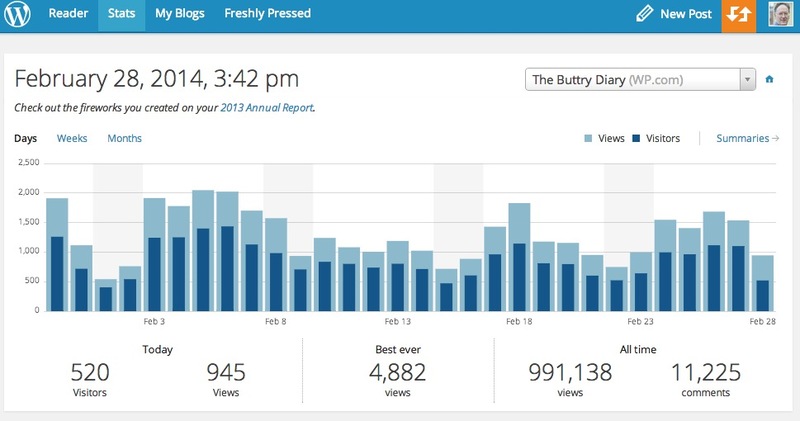 For a variety of reasons, my traffic in 2013 had dipped below 2012 levels, running 20,000 to 25,000 views most months. A post about Twitter and competition on Saturday, Jan. 4, started a surge in traffic like I hadn’t seen in over a year. Where weekend traffic usually runs a little over 500 views a day, I had 3,500 views that day and 2,000 that Sunday and then topped 2,000 again on Monday (weekday traffic normally runs a little under 1,000). With that kind of start, a strong month was almost guaranteed. That post about Twitter and competition had 6,668 views in January. The only post to draw more traffic in a calendar month was my Dear Newsroom Curmudgeon … post in April of 2012, which topped 8,000 posts its first month. A couple of follow-up posts on livetweeting and on how word of that competition post spread in social media added another 797 views combined. A second factor in the strong January traffic was the growing popularity of a post from last summer, providing advice on what to do if you hit Twitter’s limit of 2,000 people that anyone can follow. Above that limit, you need to meet a certain ratio of followers to people you can follow. This traffic is largely search-driven and resulted in 2,208 views in January. Traffic to that post has climbed every month since August, and it got twice as many views in January as it did in July, the month it was published. As I suggested in the post, Twitter should consider whether it needs to adjust that limit or provide a way for legitimate Twitter users to get exceptions. It’s not a good thing for a business when thousands of people are searching Google for help on dealing with a limitation of your product. A new editor is taking on a demanding job that doesn’t leave you much time. You probably will think you’re too busy for a blog. But editors should blog. I fully understand thinking that you’re too busy to blog. I started a weekly column right away when I became editor of the Cedar Rapids Gazette in 2008 (I had done the same thing as editor of the Minot Daily News in 1993 when blogging wasn’t an option). I meant to start the blog soon, but quickly got “too busy” and didn’t start blogging for six months. But when I made the time, my communication with staff, the public and the broader news business improved right away. A blog is worth the time. Editors should make time for it. An editor with a blog comments on community issues, explains newsroom decisions to the community, publicly praises staff members who excel and sets an important example for the staff. Editors should make time to do all those things. Even when you’re not first with the news, it’s important to be fast. Last night there was some breaking NASCAR news and I posted a quick blog about it at my NASCAR: Beyond the Track blog. Wasn’t even a big name involved, but the key fact here is that I posted my thoughts right away. It only took me a few minutes to do this, and because it was breaking news many people who were searching for information on this breaking news ended up being directed toward my blog, as almost nobody had posted anything about it.